The Romans used to drink beet juice because it was an aphrodisiac. That’s why they distributed this red vegetable all over their empire. I had no idea that beets were regarded as such in the olden days. When I bought a bunch from an organic market, all I had in mind was to make a salad out of it because the red pigment would look interesting on salad greens. Beets also contain 20% natural sugar which would make it work on a salad. One cup of this would give me about 75 calories. That information alone was enough to have me create a recipe that would fit my “salad weekends”. Husband and I devoted two days of our week for salads because we’ve been told to cut down on the meat for a while to stay healthy. Since doing so, I’ve noticed that we’ve been losing weight gradually which is a good thing by itself. However, I wanted the kids to join in. This is still a work in progress though; but I reckon this recipe would make them want to try it at least. I know the little one would be curious enough to taste it because her favorite color is red. I’ll have to wait and see. 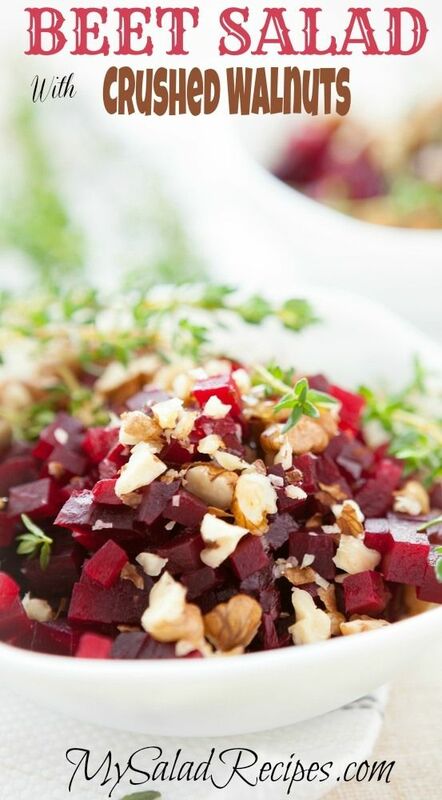 The walnuts adds a good crunch to the recipe as opposed to the texture of the beets. Biting into this would be like having a texture party in your mouth. This would make my youngest more curious so it’s a win-win for me and that counts a lot. Start by preparing the salad dressing by combining the first 5 ingredients on a small bowl. Stir constantly with a whisk. Then set aside. Next, preheat oven to 375°F. Then, it’s time to prepare the salad. Leave the root and an inch of the stem on the beets; Scrub them with a brush. Place them inside an 11 x 17 inch baking dish. Add half a cup of water. Cover this and bake for 35 minutes or until they are tender. Remove from oven to cool off and drain. Trim off the roots from the beet and slowly rub the skins to make them come off. Next, cut each beet into quarters and place on a small bowl. Drizzle over with a tablespoon of dressing and mix together. Arrange salad green on a large platter and sprinkle with salt. Drizzle the remaining dressing all over the greens. Top with beets, walnuts, cheese and chives. Best served immediately.